When and where are the 2019 IOD World Championship? 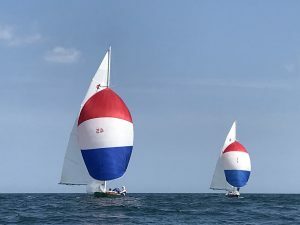 The 2019 IOD World Championships will be held in Marblehead, MA beginning registration, the AGM, and an opening reception on Saturday June 15 and ending with a Championship Dinner on Friday June 21, 2019.
Who is the host Yacht Club for the 2019 IOD World Championship? 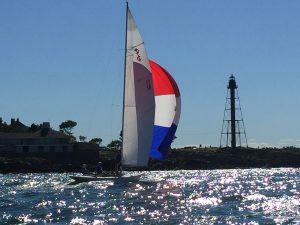 The 2019 World Championships are being hosted by the Eastern and Corinthian Yacht Clubs in Marblehead. 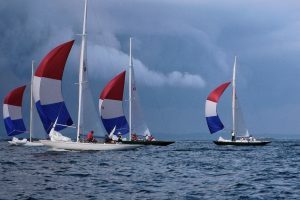 Regatta registration and initial activities will take place at the Corinthian Yacht Club, and then, mid-week, the regatta will shift its base to the Eastern Yacht Club. How many teams will be invited to the 2019 IOD World Championship? The Organizers hope to have a Championship with 15 – 17 participating teams. 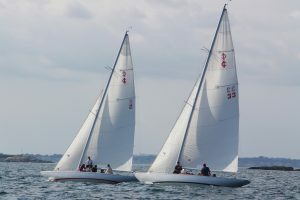 Several members of the Fishers Island fleet have generously agreed to loan the Marblehead Fleet their personal boats so that we can invite more teams to participate in the 2019 Championship. Note that these numbers are not confirmed or guaranteed at this time. How will Invitations to the 2019 IOD World Championship be allocated and sent? Invitations for the 2019 IOD World Championships are allocated and sent by the IOD World Class Secretary, following the procedures set down in the IOD Championship Regulations, Section IV. All fleets in good standing who completed a Qualifying Series of at least four races in which at least three IODs finished, should receive their Fleet Invitation in January 2019. Additional Fleet Invitations will be allocated to fleets in descending order of fleet size (as determined by the IOD World Class Secretary using the procedures set out in the Championship Regulations) and distributed as soon as possible after the initial invitations have been sent out. However, it may be the case that it may be some weeks before a sixteenth or seventeenth invitation is extended. My Fleet is interested in a second invitation, what should I do? The invitation process is managed by the WCA Secretary. The WCA Secretary will allocate invitations following the procedures set down in the IOD Championship Regulations, Section IV. However, it is never a bad idea to communicate your fleet’s interest to the WCA secretary. What is the Social Schedule? 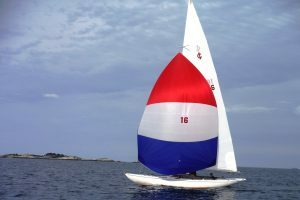 The Marblehead Fleet is planning a full week of social activities, beginning with an opening cocktail party on Saturday night June 15. There will also be small group dinners (Sunday night), a cookout and a clambake (Tuesday/Thursday), and Yacht Club Dinners (Tuesday/Friday). The Championship dinner will take place at the Eastern Yacht Club on Friday June 21. When will the Notice of Race and the Sailing Instructions be published? The NoR is under final review as we speak. It should be published here, in downloadable form, within two weeks. The Sailing Instructions will be published in late May or early June. How much is the Entry Fee for the 2019 IOD World Championship? To simplify online and in-person transactions, the 2019 IOD World Championship regatta entry fee combines the typical race management fees with our transferable social packages (valued at $400 each). The total Regatta Entry fee is $2600. (Equivalent to a registration fee of $1000 plus four social packages at $400 each) This single fee covers race management costs, regatta expenses, and four social tickets for the Championship Week. How much is the Social Fee for the 2019 IOD World Championship? The social package for the 2019 IOD World Championship is priced at $400/person. Four full (transferrable) social packages will be provided with each entry. Additional social packages will be available at registration on Saturday June 15th. Tickets to individual social events will also available throughout the week, however, individual tickets to the Friday night Championship Dinner at the Eastern Yacht Club must be purchased no later than Thursday morning June 20. What are the Insurance arrangements for the 2019 IOD World Championship? 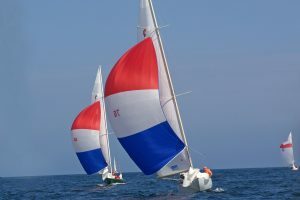 As is the case at most recent World Championships and Bermuda Race Weeks, competing skippers and co-skippers will be required to purchase a borrowed boat and personal liability insurance policy for this event. The policy will be offered to all competitors by the Organizers. The premium for that policy has not yet been determined, but is expected to be approximately $100-$150 for the week. Co-skippers will each need to purchase a policy. 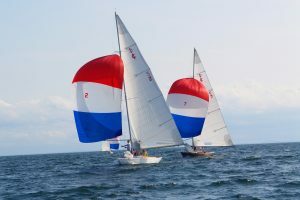 In addition to the policy, teams will need to provide the regatta organizers with a damage deposit of approximately $1500-$2000 to cover deductibles and small incidents. This damage deposit will be returned to the skippers, less any deductions for damages incurred, at the end of the regatta. We prefer to receive the damage deposit via check. Co-skippers will only be required to submit one damage deposit. We expect to be able to transact payments via check, or via credit card. A final decision on a credit card vendor has not been made, however we expect to be able to process payments made with VISA, Mastercard, and possibly American Express. There will be a small processing fee added to credit card transactions. We prefer regatta damage deposits to be made by personal check. That way we will be able to hold the checks and possibly tear yours up at the end of the week – provided there are no incidents that might be wholly or partially assessed to your deposit. What is the racing schedule? The tentative racing schedule begins on Sunday June 16. Nine Championship Races are scheduled. On Sunday, the organizers hope to complete a short practice race, plus two Championship Races. Two additional Championship Races are tentatively slated for Monday, Tuesday, and Thursday, June 17, 18, and 20. A single Championship Race is tentatively slated for Friday June 21. Wednesday is considered to be a Spare Race Day. The racing schedule is subject to change, and will likely change. 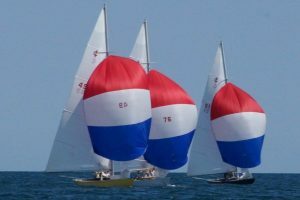 The Sailing Instructions will give the Race Committee the flexibility to deviate from this tentative schedule, in order to provide the best and fairest possible Championship Racing. The SIs will allow RC to hold up to three Championship Races on any day of the regatta. What are the expected conditions? Almost anything is possible in late June. In fact, in 2011, during the Jubilee regatta, there was a brief snow shower on the race course! Most years, late June is still dominated by our typical spring weather pattern, with colder, dense air, and fresh breezes—system driven winds. Having said that, in 2018, late June behaved like mid-July. The major wind on the racecourse was sea breeze driven, and the velocity ranged from 8kts to 14kts. If the wind is off the ocean, it can be chilly on the race course. When and where will the Annual General Meeting take place? The AGM is scheduled to take place between 1500 and 1700 on Saturday June 15, in the Harbor Room at the Corinthian Yacht Club. The agenda for the meeting will be published in advance of the meeting. Dial-in information is not known at this time. How will housing be arranged? In keeping with the long-standing tradition of the IOD Class, the Marblehead fleet will make every effort to provide visiting sailors and their guests with accommodations in local homes. Visiting teams are asked to make their housing requirements known to us by completing the online housing form as soon as possible after it is posted (sometime in February). We will do our best to accommodate every reasonable request – including spouses, children, significant others. Housing will begin on Saturday night, June 15, and end on Saturday morning June 22. Will I need a car for the 2019 IOD World Championship? We recommend that each team have access to at least one car. 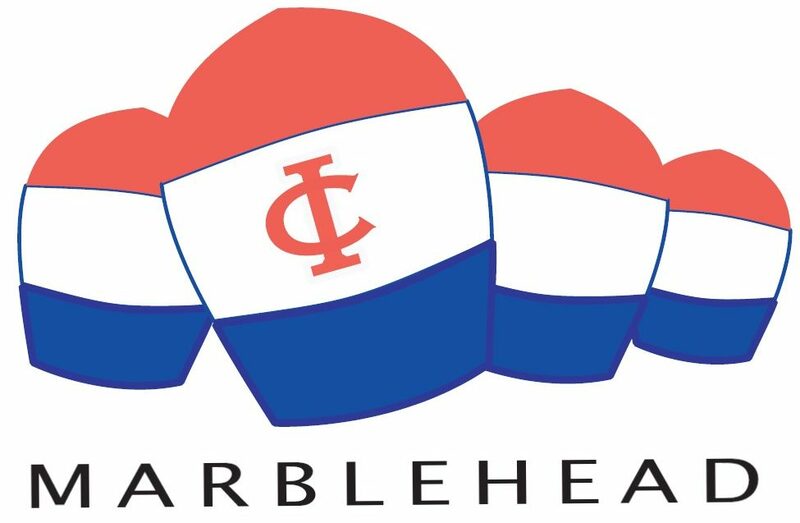 Although the majority of host homes will be in Marblehead, some teams may be housed more than a mile from the Yacht Clubs. In addition, several social events are planned to take place a short drive from the clubs. What arrangements or options are there for racing lunches? Marblehead boasts many wonderful sandwich shops would will welcome your business during the Championship week. In addition, we anticipate that one or two local sandwich shops will be on hand to take your orders in advance during registration, and after racing, for lunches that they will deliver to the club the next morning. Will there be 2019 World Championship shirts, hats and other merchandise? Can I order in advance? Yes. 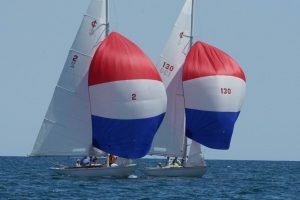 Regatta gear will be available for advance order beginning later this spring, at www.iodworlds.com. I have questions about the 2019 IOD World Championship, where should I send them? Please send your questions about the 2019 World Championship to Greg Mancusi-Ungaro at gregmu@yahoo.com. He will try to respond to all inquiries within 24 hours.